LAKE BUENA VISTA, Fla. Manti Te'o is one of the most important leaders for undefeated Notre Dame, having played in a ton of big games for the Fighting Irish. Even so, he had a tough time processing this victory. The senior linebacker was "at a loss for words" after capturing the Maxwell Award as the nation's most outstanding player, one of three honors he received at the 22nd Home Depot College Football Awards show Thursday night at Disney World. "The last time I ever dreamt of winning that award was on a video game," he said. "So to win it is a mind-blowing experience." Te'o now has won six major awards since the end of Notre Dame's regular season, also taking home the Bednarik Award for top defensive player and Walter Camp Foundation player of the year award on Thursday. He became the first defensive player to win the Maxwell Award since 1980, ending a string of nine straight quarterbacks. Next up is the Heisman Trophy ceremony on Saturday night, with Te'o and Texas A&M quarterback Johnny Manziel considered the favorites. 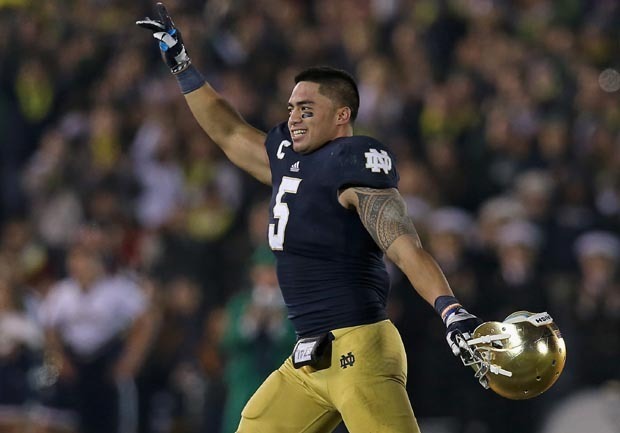 Then Te'o will try to help the Fighting Irish dethrone defending champion Alabama in the BCS national championship game. "Te'o commanded huddles, made defensive calls, covered tight ends downfield, stuffed running backs at the line, blitzed hard through gaps, helped stop two Pac-12 heavyweights at the goal line late in games, became the face of a college football staple from a sometimes thankless inside linebacker position, had six games of at least 10 tackles, gave a stale Notre Dame culture a new personality, and picked off six different quarterbacks," writes CBSSports.com's Jeremy Fowler. "Try topping that in 12 games." Wearing a black beaded lei representing his native Hawaii, Te'o said coming back to play football following the deaths of his grandmother and girlfriend just four days apart this season makes everything he's achieved since then more worthwhile. "I never thought that me coming back for my senior year would be the best situation for me with the tragedy," Te'o said. "It's a testament that the Lord answered my prayers and that I had 80-plus brothers there with me, sacrificing for me." Te'o finished the regular season with 103 tackles and seven interceptions. Notre Dame coach Brian Kelly, who was presented with the Coach of the Year award after leading the Irish to their first 12-0 regular season since 1988, said Te'o is an example of the family culture he's tried to build in his three seasons in South Bend. "Everybody knows you don't do it with one guy," Kelly said. "Collectively, everybody just bought in. ... We still got one (game) left. We want to finish it off the right way." While Te'o and Notre Dame certainly had a big night, so did Texas A&M. Manziel won the Davey O'Brien National Quarterback Award and junior offensive lineman Luke Joeckel took home the Outland Trophy for the nation's best interior lineman. Other players honored Thursday were Southern California's Marqise Lee (Biletnikoff Award for top receiver), Tulane's Cairo Santos (Lou Groza Award for top kicker), Louisiana Tech's Ryan Allen (Ray Guy Award for top punter), Mississippi State's Johnthan Banks (Jim Thorpe Award for top defensive back), and Wisconsin's Montee Ball (Doak Walker Award for top running back). Manziel acknowledged he will be nervous Saturday knowing he has a chance to win college football's most hallowed individual honor. Kansas State quarterback Collin Klein is the third finalist for the Heisman Trophy. Three sophomores have won the Heisman, including Tim Tebow in 2007, Sam Bradford in 2008 and Mark Ingram in 2009. The best a first-year player has ever done is second. "I had high expectations, but I never would have expected this for myself," said Manziel, a redshirt freshman. "I'll be with two of the best players in the country, all eyes are on you. It's the biggest award in college football. I think you're gonna have a few butterflies." Joeckel said even he has been amazed at watching "Johnny Football" and his exploits this season. "It's hard to protect for someone when nobody knows where he is," Joeckel said. "He's a fun guy to block for." Texas A&M coach Kevin Sumlin said that type of level-headed poise is what has defined his quarterback all season. "The way he plays, no moment has been too big for him," Sumlin said. In one of the non-competition awards presented Thursday, Texas long snapper Nate Boyer was honored with the Disney Spirit Award, given annually to the most inspirational figure or team. Boyer, a 32-year-old sophomore, earned a Bronze Star for his service with the U.S. Army Special Forces Unit and has also provided assistance to autistic children and Darfur refugees. Former Notre Dame coach Ara Parseghian was honored with the Contribution to College Football Award for his works off the field. Kelly said the former coach is every bit as revered as he was in his prime leading the Irish. "He walks with a limp, but let me tell you, he could still coach today. And he can tell me things about my football team." Kelly said.